Angel of Arnhem | Uitgeverij Kontrast . During the Battle of Arnhem Kate ter Horst-Arriëns lives with her family in the old vicarage next to the Old Church in Oosterbeek, the village where the battle is finally decided. There she and her husband are asked by the British to open their house as a first-aid post after the airborne landings on 17 September 1944. They agree, but the rapid victory that had been hoped for, fails to materialise and soon all rooms are crammed with wounded. Kate ter Horst is doing her utmost to help the often badly injured soldiers. 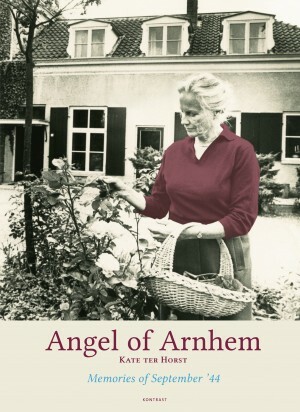 It gives her the title “Angel of Arnhem’; the survivors would never forget her. 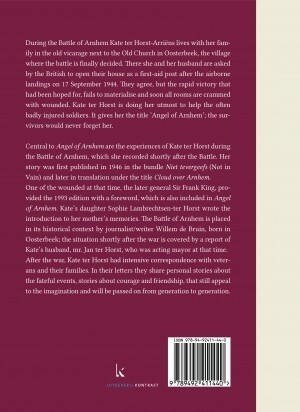 Central to Angel of Arnhem are the experiences of Kate ter Horst during the Battle of Arnhem, which she recorded shortly after the Battle. Her story was first published in 1946 in the bundle Niet tevergeefs (Not in Vain) and later in translation under the title Cloud over Arnhem. One of the wounded at that time, the later general Sir Frank King, provided the 1993 edition with a foreword, which is also included in Angel of Arnhem. Kate’s daughter Sophie Lambrechtsen-ter Horst wrote the introduction to her mother’s memories. The Battle of Arnhem is placed in its historical context by journalist/writer Willem de Bruin, born in Oosterbeek; the situation shortly after the war is covered by a report of Kate’s husband, mr. Jan ter Horst, who was acting mayor at that time. After the war, Kate ter Horst had intensive correspondence with veterans and their families. In their letters they share personal stories about the fateful events, stories about courage and friendship, that still appeal to the imagination and will be passed on from generation to generation.